If you forgot to set your DVRs to record Tuesday’s episode of “Countdown to UFC 150: Henderson vs. Edgar II” on FUEL TV, no worries because we’ve located to footage for your viewing pleasure. 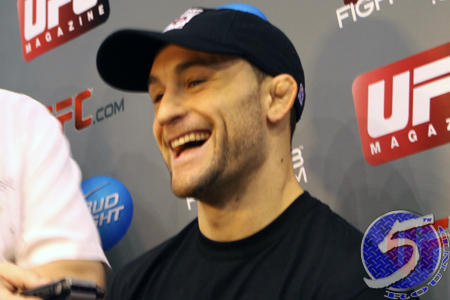 This 60-minute documentary focused on the lightweight title tilt between former champ Frankie Edgar (Pictured) and Benson Henderson, the man who took his crown. UFC 150‘s co-featured attraction with Donald Cerrone and Melvin Guillard, as well as middleweights Jake Shields and Ed Herman also appeared in the promo video. If you’re one of those who just can’t stand watching shows on your computer monitor, FUEL TV airs “Countdown to UFC 150″ replays on Wednesday (5AM ET and 6PM ET), Thursday (11PM ET), Friday (5PM ET) and Saturday (6PM ET). Pepsi Center in Denver, Colorado hosts Saturday’s festivities. The pay-per-view broadcast begins live at 10PM ET/7PM PT.